Gingivitis is a very common gum condition that’s easily treated when it’s caught early. The dentists and licensed hygienists at Heinbach-Larkin Dental encourage you to prevent gingivitis with regular checkups and professional teeth cleaning. Contact one of their offices in Topeka and Lawrence, Kansas, or schedule an appointment online for comprehensive gingivitis screening and a personalized plan to help you prevent gingivitis. Gingivitis is the medical name for swollen gums. The first sign of gingivitis is usually bleeding after brushing or flossing your teeth. Your gums may also bleed after eating something hard that rubs against your gums, like a fresh apple. You may also notice red, swollen, or tender gums, bad breath, or a bad taste in your mouth. If you don’t routinely brush your teeth, the bacteria in your mouth mix with saliva and form a film called plaque. Plaque sticks to your teeth, which gives bacteria plenty of time to irritate your gums and cause an infection. Plaque buildup is the most common cause of gingivitis. You have a higher risk of developing gingivitis if you have diabetes or you smoke. Some medications also affect the health of your gums. If you take a prescription medication that causes dry mouth, be sure to mention it to your dentist at Heinbach-Larkin Dental, because a dry mouth makes you more susceptible to gingivitis. Why is it important to get gingivitis treated early? Untreated gingivitis gets progressively worse, turning into periodontitis, a serious gum disease. When you develop periodontitis, the bacterial infection spreads, destroying the soft tissues and bone that support your teeth. The primary cause of gingivitis is poor dental hygiene that allows plaque to build up. Daily brushing and flossing are the keys to preventing gingivitis. Professional teeth cleaning to remove plaque that has hardened on your teeth also prevents bacterial infection. The team at Heinbach-Larkin Dental provides comprehensive gingivitis screening when you come in for a dental exam. Getting a routine checkup is the best way to catch gingivitis in its earliest stage, before you begin to experience symptoms or the disease has time to do real damage to your mouth. 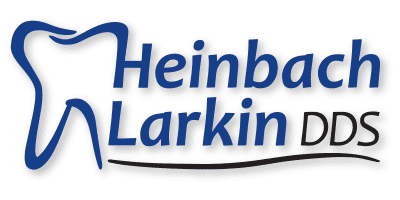 The licensed hygienists at Heinbach-Larkin Dental are trained to treat gingivitis. During teeth cleaning, they may use instruments to remove all of the plaque and tartar (hardened plaque) in a process called scaling. After a thorough cleaning, they work with you to create an individualized plan. They give you specific steps to take at home, to treat existing gingivitis and prevent it from developing in the future. Other types of treatment may be needed if the inflammation is extensive, the infection has spread, or it has progressed into serious gum disease. The dental team will discuss your options for treating moderate to advanced gum disease after evaluating the extent of the problem.